Under Rose Tainted Skies– I read this in January and as such I don’t have quite such clear memories of it as I do with the books I read later in the year, but I do remember that this is an incredibly powerful story about a girl named Norah, who has agoraphobia. I loved the romance and the fact that Luke doesn’t magically cure Norah, the dark humour and Norah herself. Most of the book is set in one place and we are in Norah’s head the whole time, and while her head isn’t a pleasant place to be it’s one that makes for a truly gripping and heartbreaking reading experience; I had so much sympathy for Norah and all I wanted while reading was for things to get better than her. Secrets of a Teenage Heiress- I really enjoyed the It Girl series, and I loved this first book of Katy Birchall’s new series even more. It focuses on spoiled heiress Flick, who lives at the famous Hotel Royale, as she is forced to change her ways and work in the hotel whilst she is grounded for a rather lengthy period. It’s so much fun, and Flick’s character development from beginning to end is fabulous. Also, I adore her daschund Fritz, who is an Instagram star. This is absolutely hilarious too, just as anyone who read the It Girl would expect, and I seriously need to get to the 2nd one soon! Truly Wildly Deeply- I loved Stargazing for Beginners last year, and I also thoroughly enjoyed this companion novel about Men’s friend Annie and her romance with Fab. It’s so sweet and romantic and funny, Annie’s determination and strength are wonderful and it was so cool to see cameos from a few members of the Broken Biscuit Club. I’m being pretty greedy here, but I really hope Jenny writes a book for each of them now. I’m super excited to pick up her MG debut in 2019 too though! Inferno/Mafiosa- while I quite liked the first in this series when I read it ages ago in January of 2017, I seriously didn’t expect to fall completely head over heels for these two sequels. They follow Sophie Gracewell, whose life becomes entangled with the Falcone family, who just happen to be members of the mafia. They are thrilling, romantic and full of tension; I could barely put them down while I was reading them, and they left me breathless often because the action was non stop and often super unexpected too. There are some killer twists, and I shipped Luca and Sophie so much I can’t even tell you. Team Luca for life! Sophie’s bestie Millie also deserves a mention here, because I bloody loved her even though I found her a bit irritating in the first book- she grew on me so much! The humour is excellent too! I Was Born For This– while I didn’t love this just as much as Radio Silence, which I read in 2017, I still loved it an awful lot. It’s about the meeting of fangirl Angel and band boy Jimmy, and the different problems they are both currently facing. I loved them as narrators- particularly Jimmy- and Alice Oseman has such a knack for writing memorable secondary characters too. In this book, my particular faves were Rowan and Bliss, but Lister was a darling too and I honestly just kind of loved them all. This manages to be emotional and funny and somehow thrilling all at once, and it’s great. I’m so excited to see what Alice does next, and also to finally read her debut Solitaire. Open Road Summer– god, I loved this book. I read it one night during the summer when I was feeling rubbish, and my neighbours were driving me particularly wild with rage, and I finished it in a couple of hours because I got so swept up in Reagan’s story. Emery Lord’s writing is divine, this romance and the male lead are among my favourites ever, the music tour setting is super, super fun and I just loved this. If you’re looking for a summery romance in 2019, I don’t think you could go far wrong with this. When We Collided– yes this is another Emery Lord book and yes, I am basically obsessed with everything she’s written. I read this on another rubbish day when I was feeling incredibly worried about an impending hospital visit, because of how much Open Road Summer lifted my spirits, and it took my mind off things so well. Jonah and Vivi are so wonderful, Jonah’s family are too precious with the way that all the siblings try and look after each other and I really love how noticeable the fact that Emery Lord’s distinctive writing style shifts ever so slightly to reflect her narrator’s interests and personality is because of the dual narrative. P.S I Still Love You– this is the 2nd in the Lara Jean trilogy, and I loved it. I’ve now read all 3 books by the time I’m writing this, and while I enjoyed the first and third very much, this is undoubtedly my favourite. The love triangle was so great- mostly because I liked both boys so much that I could enjoy every romantic interaction, rather than hissing at the one I hated (*cough* JOSH *cough*) like I was in book when he had time with Lara Jean. The cosy vibe of this series is brilliant too, and I also adore the relationships Lara Jean has with her family. The addition of the nursing home and it’s eccentric residents made this super fun too, and I also really enjoyed the game of assassins, which I got ridiculously invested in, ngl. Fierce Fragile Hearts- I was so confident that I’d like this book that I added it to this post before I’d even read it, and Sara Barnard did not let me down. It follows a secondary character from her first book Beautiful Broken Things, and as I loved her then and really wanted to see what happened to her I was so excited when this was announced. It’s such a gorgeous story, and it sees Suzanne still traumatised by the abuse of her childhood, but attempting to build a new life for herself in Brighton after leaving the care system. Much like with Sara’s other books, I adored Suze as the protagonist, I thought the secondary characters were wonderful/absolute horrors as appropriate and I could hardly put it down because there’s just something so addictive about Sara’s writing. Also, the romance is fabulous. I can’t recommend picking this up in 2019 enough, especially if you live Beautiful Broken Things and Suzanne. Look out for my review of this in my reviews post going up next week! The Year After You- this was another one that I read in December, and while I thought I’d like it, I had no idea I’d love it as much as I did. It’s Nina de Pass’s debut novel, and it follows a girl named Cara as she is “exiled” by her mother to a Swedish boarding school in order to try and make a fresh start after the death of her best friend in a tragic car accident nine months earlier on New Year’s Eve, in which Cara was the driver. Again, I’ll be sharing my proper thoughts in my reviews post, but for now; I loved the flawed but somehow utterly loveable characters in the friendship group Cara meets when she gets to Hope Hall, I really wanted things to turn out well for them and I was teary/breathless on numerous occasions because the book is so moving and I found Cara such an engaging narrator and complex character that I was rooting for so very much despite the mistakes she makes in both past and present. This is definitely one to keep an eye out for in 2019! 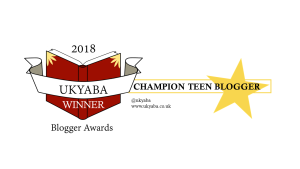 What were your favourite young adult books of 2018? Are there any you think I’d enjoy? I’d love to hear your recommendations in the comments! If you’re interested in my favourite middle grade picks, that post will be up on Saturday, and I’m so excited to go and write that now so I can ramble about all of them too! I’ve only read I was Born for this from your list but I do adore Alice Oseman and her writing style. For me I agree that I prefer Radio Silence but one book I need to reread is her Solitaire novel because I read it so long ago that I have mostly forgotten it! Oh I look forward to it! Have you read Heartstopper yet? I’ve only read one from your list (Under Rose-Tainted Skies) but have read the first book in To All The Boys I Loved Before and Blood for Blood series. I will add these all to the TBR list! I have only read Beautiful Broken Things of her books so far, but will definitely read more! Excellent list! I’m currently reading The Year After You and it is absolutely my type of book. I am in love haha. Ah, I haven’t read any of these! I guess I’ll have to check them out. One of my favorite YA books was Tempests and Slaughter by Tamora Pierce. The only one on your list I’ve read is I Was Born For This and I really loved it. I think I have Under Rose Tainted Skies and When We Collided on my TBR.